Sweden is one of the Scandinavian countries located in northern Europe, bordered by the Baltic Sea, the Gulf of Bothnia, the Kattegat, Skagerrak, and Öresund straits, by Norway in west on the Scandinavian Peninsula, the Torne river forms most of Sweden's border with Finland in east. A portion of the country lies north of the Arctic Circle. The country has maritime borders with Denmark, Germany, Poland, Russia, Lithuania, Latvia and Estonia. With an area of 450,295 km² Sweden is roughly twice the size of Great Britain (island), or slightly larger than the U.S. state of California. The landscape is mostly flat with gently rolling lowlands, over half of the country is covered by forests. There are mountains in west, Sweden shares the Scandinavian Mountains, also known there as the Kölen Fjällen range, with Norway. Within that range to the north near the border to Norway is the highest mountain in Sweden, the Kebnekaise massif with 2,097 m (6,882 ft) at its highest point. Almost 10 % of Sweden's area are lakes and rivers, the largest lake is Lake Vänern, it has a surface area 5,650 km², making it the largest lake in the European Union. 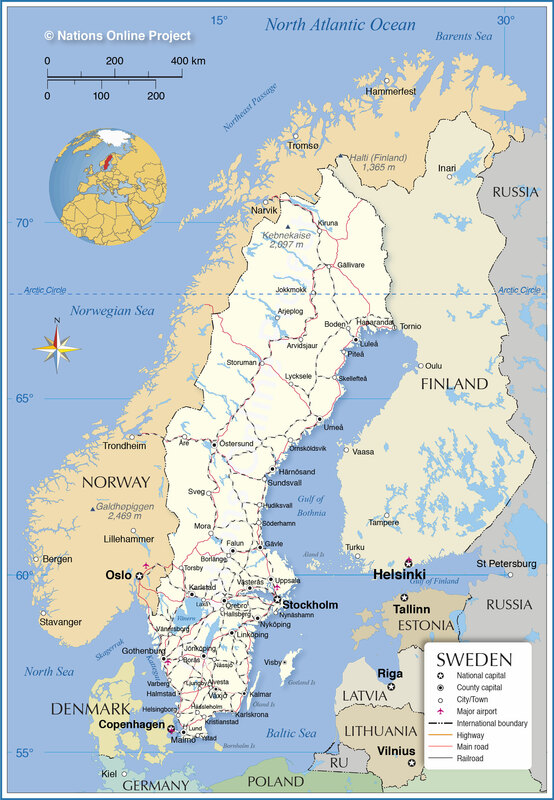 The Swedish population of 9,7 million people is concentrated in the southern part of the country, spoken languages are Swedish, a North Germanic language, similar to Danish and Norwegian, English is widely spoken. Scandinavia is a historical and cultural-linguistic region, it comprises the three kingdoms of Norway, Sweden and Denmark. The term Scandinavia referred originally to Scania (Skåne), a region formerly Danish, now Swedish. Depicted on the map is Sweden with surrounding countries, international borders, major cities, main roads, railroads, and major airports.